Mmm-mmm! Tasty peanut butter sandwiches! Just eating one takes you back to those days back when you were a wide-eyed second grader sitting out there in the schoolyard, trying to eat lunch by yourself while the other kids laughed at your underwear peeking out of your pants. Relive those days by making a peanut butter sandwich of your own. You will need the following: a jar of peanut butter, two pieces of bread, and a knife. Place the pieces of bread flat on the countertop. Open the jar of peanut butter. Grasp the knife firmly while being aware of your surroundings. Safety first! Don’t just stand there, she’s bleeding out! Get some towels or something! Apply pressure to the wound! Hurry! I think…I think she’s stopped breathing. No, no! Don’t call 911! Look, your neighbors heard you arguing with her yesterday, right? You really think anyone’s gonna believe this was an accident? Okay, don’t panic. Let’s think about this. All right, how much cash you do have in the house? You can’t use your credit cards! The feds can trace those! Get your cash together, as much as you can! I know this guy, Ricky, out in Chino Hills. He’s got some friends in Mexico. He can be here in about 45 minutes, and he’ll take you to them. You should be safe there for a while. He’s gonna want about $300. You got that? Okay, you got some cash. Get that duffel bag out of the closet, fill it with clothes. You’ll need them. No, leave your cell phone! Just called Ricky, he’ll be here soon. Just calm down, breathe deeply. Draw your curtains, for God’s sake. Now, it’s gonna take several hours to get down to Mexico, so you better pack something to eat to keep your energy up. Oh, hey, peanut butter sandwiches. Scrape some peanut butter out of the jar with your knife. Spread the peanut butter evenly on the slices of bread. Place the pieces of bread together. Congratulations! You’ve made a peanut butter sandwich! Eat it now, or save it in your duffel bag for later. DON’T make eye contact with authorities. You’re nervous and upset, and you’ll easily attract attention. DO pay cash for everything. Avoid bartering with personal items like watches or jewelry or anything else that can be traced back to you. 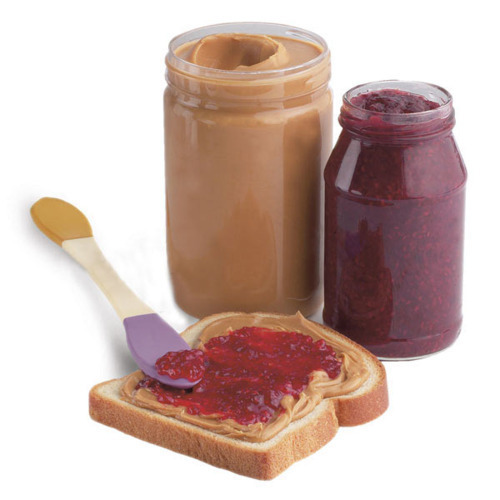 IF you are using Reduced Fat Peanut Butter, note that it does not spread as smoothly as regular peanut butter, which could shred your bread as you try to apply it. Use a light touch.